My daughter and I visited Red Clay State Historic Park today. This is the first time in years that we have been there together. We hope to be able to go back soon. 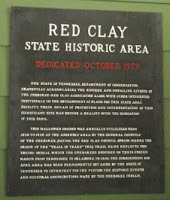 Before the Cherokee was removed from their homes there was Red Clay. This is where their final council ground before being relocated to Oklahoma. It is quiet, remote and one of the more peaceful state parks that I have ever visited. It is only within Tennessee by a few miles. Those who are coming from Georgia will find it next to the Tennessee line near Cohutta in Whitfield County. There is an ongoing list of special events that take place here. Each of these is designed to celebrate the strong culture of the Cherokee. These family oriented events are always a good way to learn more about the significance of Red Clay and its importance to the Cherokee. 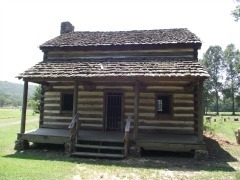 A list of events is available on the Tennessee State Parks website. Red Clay State Historic Park has a picnic table and a pavilion is available for rent. The visitor center is a bookstore and a research facility for people who want to learn about their Cherokee ancestry. There are wide open fields, historic displays, buildings and a wide accessible pathway. 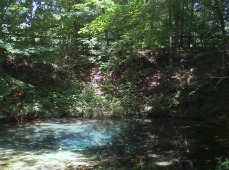 One of the key features of Red Clay State Historic Park is the famous Blue Springs. A visit here is always a treat. My daughter and I enjoyed our visit and took these photos while we were there. This is one of those off the beaten path spots that everyone should visit. 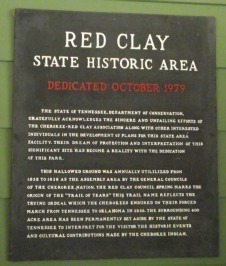 It is located at 1140 Red Clay Park Road in Cleveland, Tennessee. The Mennonite Farm Market, Englewood, TN: A fruitful experience!